People have always studied each other trying to figure out why they are the way they are and to predict future behaviour. Trouble is, sometimes what can seem like an okay thing to do can actually turn out to be dodgy and hurt people. This unit of work explores how psychologists work out what is okay and what is not. Task: Open up the NZ Code and have a good look at how it is structured. Imagine yourself as the subject in some research. What kinds of things would you expect to be able to happen / not happen? Task: Check out the similarities and differences between the NZ version and the British version. Do they follow similar guiding principles? Task: Review each of these experiments. Do you agree with their ranking? Re-order if necessary. Decide on your top 3 (most unethical/ least ethical/ worstest / nastiest) experiments. For each of these note exactly what is unethical about the experiment. Can you identify the key features that are unacceptable. Righto, so the theory seems pretty straight forward? Seems obvious that some types of research are a bit dodgy. But, people generally have a good reason for wanting to test some ideas so it is not always so simple. Thousands of critically ill or unconscious patients have been enrolled without their consent in clinical trials to test treatments in New Zealand hospitals. A medical ethics committee delayed approving a drug company's application in March for an antibiotics trial at Auckland and Christchurch hospitals so it could obtain legal advice from Crown Law. The lead researcher for the trial told the health and disability ethics committee that, in line with similar applications approved in the past, the aim was to get permission from relatives of the patient and then "retrospective" consent once they had recovered. 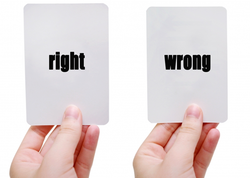 Using the flashcards below, learn about the four guiding principles and their related values of the NZ Psychological Society's Code of Ethics. Once you have used the flashcards click at the bottom on 'view this study set'. You can play matching games to consolidate your learning. Task: Watch the video tutorial to the right. This recaps the main points we have covered so far about ethics in Psychology. If you have missed any classes this is a good place to catch up! What are your thoughts on the wee study? Is it unethical? Which value statements does it breach? Could this be studied more ethically? Practise Questions for the Assessment!! Below are some practice scenarios. Read them and use them to practise answers for the test. What would your decision be? Are the studies compliant or non-compliant? The Harlow Monkey study is also a practise for Task 3 on the assessment. This is where you can pick up marks towards the merit and excellence criteria. Questions are at the end of the practice scenarios paper. Make sure you focus on discussing the 2 views of compliance - e.g if you change the study to make it more ethical what impact will that have on the results? What has been the long term benefit to society of Harlow's study? Does this outweigh ethical concerns? The Facebook Emotion Study - Your Thoughts? Recently Facebook was criticised after they revealed they had conducted a study without users knowledge. Watch the clip. Read the articles. Prepare your responses to the following questions for a class discussion on this issue. Facebook is not a psychological society member. They are a corporation. Should they be covered by the same kind of ethical guidelines as psychological researchers? Facebook claimed that users give their complicit consent to research because they all sign a disclaimer upon joining. Does this cover it in your view? Essentially Facebook subliminally manipulated the emotions of thousands of users. Is this concerning? Are you bothered? Who else might want to engage in this kind of thing? For what purpose?